From on-demand trucking to blockchain, loadboards and freight matching, the list of companies bringing innovative technologies to the freight industry is growing by the day, which makes the 100 that have made the cut to be honored by the FreightWaves Research Institute as part of its inaugural Freight.Tech 100 all the more special. CogoPort is an example. The company believes that booking ocean freight should be as easy as booking a hotel room. Its platform provides instant quotes, helps choose the right ocean carrier, allows for the uploading of documents and manages all shipments. Or consider Convoy and Uber Freight, companies that are working to bring on-demand trucking mainstream, with platforms geared toward streamlining the freight matching process while delivering value-adds for carriers, shippers and drivers. The Freight.Tech 100 is not all about young upstarts, either. Companies like Cummins (NYSE: CMI) and Daimler AG (OTC: DDAIF) made the cut. Cummins is pushing the envelope with advanced technologies including electrification of commercial powertrains. Daimler AG is among the world’s largest innovators, with electric, autonomous and mobility solutions becoming an ever-greater part of its portfolio. More than 500 nominations were received for the Freight.Tech 100, and the winners will now go into a second level of competition to become part of the Freight.Tech 25, which will be announced at the MarketWaves18 conference on Nov. 12–13, 2018 at the Gaylord Texan Resort & Convention Center in Grapevine, Texas. To register, visit https://www.freightwaves.com/marketwaves18/. The initial vote was a blind vote conducted by the 9 voters. To be named to the Freight.Tech 100, a company had to secure at least 5 votes from the 9. The first round of voting was undertaken by FreightWaves employees. The next round to determine the Freight.Tech 25 will be conducted by 56 independent voters in a process managed by acclaimed accounting firm Katz, Sapper & Miller (KSM). The voters will use a 1–25 sliding point system (25 points for first, 24 for second, etc.) to rank the companies. The top 5 companies will receive a special recognition at MarketWaves18. The Freight.Tech 100 is designed to recognize the most innovative and disruptive companies in freight. As such, it seeks to recognize those companies that are most disruptive, and few have been as disruptive as Amazon (NASDAQ: AMZN), which makes the list. Blockchain and artificial intelligence are prominent technologies for several companies in the Freight.Tech 100, including dexFreight and Fr.8 Network. Learning Machine is another company using blockchain to disrupt. “A leader in the development of blockchain technologies, Learning Machine provides a secure platform to issue records in a format that is tamper proof, recipient owned, and independently verifiable,” noted a comment on the nomination form for the company. Some companies, like Intelligent Audit, received glowing reviews from those that nominated them. “They are on the cutting edge in their space for automation and normalization of carrier data analytics,” said one of the comments on IA’s nomination form. The companies on the list cover all modes of transportation. Traditional freight companies such as J.B. Hunt Transport (NASDAQ: JBHT), which has invested over $500 million in technology in recent years, and Landstar System (NASDAQ: LSTR) are joined on the list by ocean carrier Maersk, which is working with IBM to develop blockchain solutions, showing that innovation doesn’t just come from Silicon Valley. In addition to truck OEMs like Daimler AG, Navistar (NYSE: NAV) and Paccar (NASDAQ: PCAR), startup manufacturers like Nikola Motor Company, which is building a hydrogen fuel-cell tractor, are being honored in the Freight.Tech 100. Companies like Dock411, KeepTruckin’, PEIR Mobile, and Konexial are all working to improve the driver’s experience with their innovative use of technologies and made the list, representing a number of driver-focused companies. 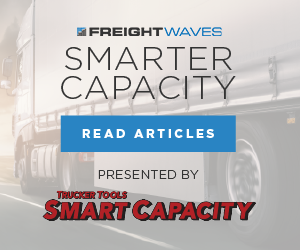 Logistics companies such as Echo Global Logistics (NASDAQ: ECHO), Arrive Logistics and BlueGrace Logistics are among the companies that have been hard at work developing innovative solutions to help shippers and carriers more effectively move freight. Even a company like Logistical Labs, which is a tech provider working to help brokerages drive sales and manage margins, shows that innovation can come from many sources. Other technology companies that made the cut include Pegasus Transflo, Platform Science, project44, Spireon, Trimble (NASDAQ: TRMB), and McLeod Software. Other companies of note on the list include Toyota (NYSE: TM), Tesla (NASDAQ: TSLA), Thor, Werner (NASDAQ: WERN), Reliance Partners and C.H. Robinson (NASDAQ: CHRW). The FreightWaves Research Institute focuses on surveys, research, awards and credentialing. The full list (in alphabetical order) of companies appearing on the Freight.Tech 100 follows. Those companies making the Freight.Tech 25 will be announced at MarketWaves18 on Nov. 12–13, 2018 at the Gaylord Texan Resort & Convention Center in Grapevine, Texas. To register, visit https://www.freightwaves.com/marketwaves18/.